Today more and more people are using suction-mounted cameras. They provide an excellent way to record possible accidents, giving clear, unfiltered visual evidence of any collision or other incidents that might occur. 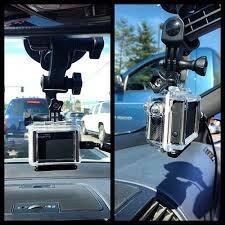 In addition, insurers are beginning to offer insurance discounts to drivers that use suction-mounted cameras. Not only do they offer clear-cut evidence in disputes, to some insurers their use also demonstrates a certain commitment to safety and accountability. However, many suction-mounted camera users are not aware that they could be breaking the law. Placement of the camera is actually subject to strict laws and failing to position it correctly is a serious traffic offence. Many drivers – in an attempt to safeguard themselves and drive safely – are actually unwittingly breaking the law. Below, we look at how the law works and how you can avoid running afoul of it. Most people using a suction-mounted camera for the first time will probably think about mounting it somewhere on the windscreen – somewhere with easy visibility and quick access. However, this could actually mean that the driver is already committing a number of possible traffic offences according to the Road Traffic Act 1988. Placement of a suction-mounted camera – including the camera itself, any cradle, or suction cups – comes with very detailed and specific rules about placement. Contravening these by even the tiniest amount could result in punishment as prescribed by sections 2 or 3 of the Road Traffic Act 1988. No part of the device can encroach more than 4cm into the secondary zone, which comprises the pink area, which is the movement arc of the wiper. Furthermore, the law allows for only 1cm of intrusion into the red zone, which represents the primary area of a driver’s view. Allowing a suction-mounted camera, or related components, to infringe on these areas could lead to a charge of dangerous driving or careless driving (insert link). Mounting a suction-mounted camera on the majority of the windscreen means contravening the UK Road Traffic Act 1988. No part of the device – camera, cradle, suction cups and any wires – cannot intrude more than 4cm into the wiper arc of the windscreen. Even stricter, the same components cannot impinge more than 1cm into the ‘red zone’, which comprises the driver’s view. Failing to do this could result in a charge of careless or even dangerous driving in Scotland. As well as the law prescribing suction-mounted camera placement, there are also serious stipulations around viewing the accompanying LED screen. These stem from The Road Vehicles Regulations 1986. It may seem like common sense to most people that it is a bad idea to look at the LED screen whilst the car is moving. This is the exact same line of reasoning that the law says it is illegal to use a mobile phone or other device whilst driving – the driver’s attention is elsewhere, when driving requires one hundred percent of their concentration. However, there are further stipulations when it comes to the LED screen of a suction-mounted cam. The law actually says that, if the screen is on at any time during a journey and the driver can see it, then this is another serious offence. Any moving image, no matter how small or even if it does not require the driver’s hands to operate, provides a dangerous distraction.